Expand your reach and offer video counseling to your customers with a virtual office. Let’s Talk Counseling can help connect you with a client base seeking Behavioral Health, Life Coaching, and Faith Based services. Join our community of professional Behavior Health, Life Coaching, and Faith based providers and grow your potential client base. Let’s Talk Counseling eliminates the barriers associated with traditional brick and mortar counseling. When you appear in a client’s search results, they will be able to view your public page to learn more about your expertise, fees, and availability. LetsTalkCounseling.com has been the best investment for my practice. I highly recommend LTC to every mental health provider. Claire R. Reeves, MA, C.C.D.C., Ph.D.
Let’s Talk Counseling gives our providers a Virtual Office to help manage their online business. 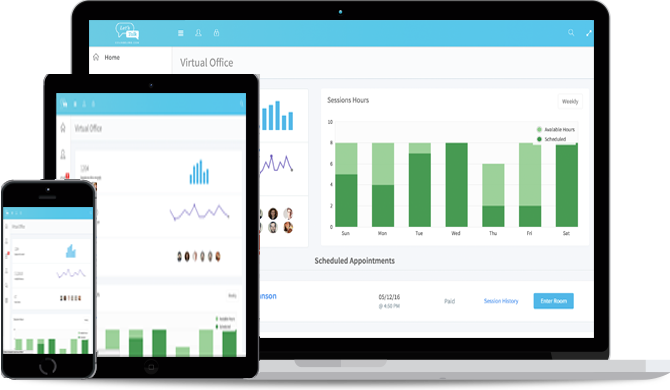 The Virtual Office provides tools to help with scheduling, session fees, and analytics including revenue tracking and page hits. The Virtual office also includes a public page that will appear in client search results. This page will detail your areas of expertise, and help prospective clients learn more about you prior to requesting an appointment. Our providers can use this page to help promote their business. Great virtual office setup! The provider page is easy to set up and looks great! Why Start an Online Practice with Let’s Talk Counseling? Let’s Talk Counseling is a cost effective way to grow your business. Providing HIPAA compliant services through Let’s Talk Counseling can give you the opportunity to expand your business without taking on the additional overhead expenses associated with a brick and mortar practice. With the elimination of geographical barriers, your potential client base will grow exponentially. Is providing Online Services safe and Secure? Let’s Talk Counseling has taken every precaution to ensure security and HIPAA compliance. We can help you eliminate the limitations associated with traditional brick and mortar establishments. Let’s Talk Counseling can give you the ability to offer your clients access to HIPAA compliant care that can be accessed from any device with internet access. Is Let’s Talk Counseling HIPAA Compliant? Let’s Talk Counseling is a fully HIPAA compliant site. Our team has worked diligently to ensure every aspect of the site and your online practice will be HIPAA compliant. Our members have access to a Business Associate Agreement (BAA), should their practice receive a HIPAA audit. Provide HIPAA compliant secure video sessions to new and existing clients. Connect with more clients seeking Life Coaching, Mediation, or Career Coaching and grow your business. Expand outreach efforts to and beyond your congregation. Need a group rate? Contact Us. Simply click below to start the registration process. Once completed, you will have access to your Virtual Office. Follow the simple directions provided to set up your personal provider page. Once your provider page has been set up, you will be visible in search results and ready to take new clients. Legislation in this area is changing at a rapid pace, generally in support of Telehealth. We recommend you contact your state licensing board (http://www.fsmb.org/policy/contacts) or regional Telehealth resource center (http://www.telehealthresourcecenter.org/) for the most current information. National Conference of State Legislatures: State coverage for telehealth services. See at a glance which states provide Medicaid or private insurance coverage for telehealth, or both. American Telemedicine Association: wiki page on state laws for detailed analyses, reports, and on-going legislative actions surrounding the adoption of Medicaid and private insurance coverage for telehealth. They also have a paper for State Telemedicine Gaps Analysis, in which each state is graded based on existing policy barriers to telemedicine. Center for Connected Health Policy: interactive map and policy search, sorted by state. This article was last reviewed by our Support team on June 1, 2015. Your Client will pay you directly via PayPal or Stripe. If you do not already have a PayPal or Stripe account, follow the simple instructions in your Virtual Office to sign up and integrate PayPal or Stripe into your personal provider page. Let’s Talk Counseling does not take any portion of the revenue generated by providers. What comes with my Virtual Office? Your Virtual Office will give you visibility to your current online client base, allow you to schedule appointments, and provide HIPAA secure video sessions. You will have the ability to upload your own intake documents securely and manage your provider web page. Payments will be sent directly to you from your client via PayPal. The Virtual Office will also give you visibility to analytics, to show you how many page hits your personal page is getting, along with how much revenue your online practice has generated. How Much does Lets Talk Counseling charge? Get started today for $99 per month, or $999 for one year of service (savings of $189 with an annual membership). Let’s Talk Counseling is accessible from any device with internet connectivity. To utilize the HIPAA secure video chat, you will need a device with a camera and microphone. How will LetsTalkCounseling.com help me grow my business? Marketing your business is both expensive and challenging. Give Let’s Talk Counseling the opportunity to help you market your business through your personal web page at LetsTalkCounseling.com/YOUR_NAME. Your personal page will give potential clients visibility to the services you offer, licensing information, etc. Tie your Social Media accounts like Facebook, Twitter, Instagram, and LinkedIn to your provider page to gain more visibility. 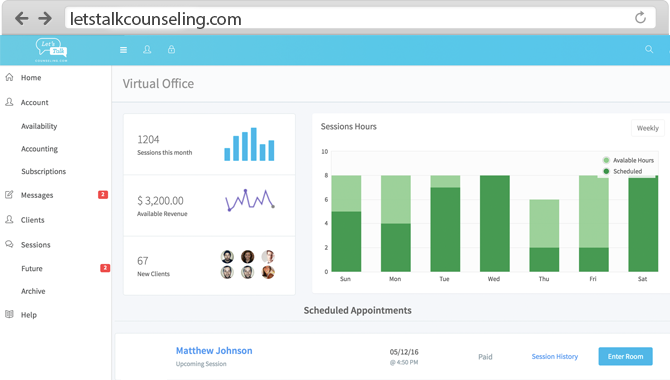 Let’s Talk Counseling will also drive traffic to your online practice through our marketing efforts to help connect clients with providers. Does Membership include a Business Associate Agreement (BAA)? Because our system was built from the ground up to be HIPAA compliant, we will provide a signed Business Associate Agreement upon request. How does Let’s Talk Counseling meet standards for the Health Insurance Portability and Accountability Act (HIPAA)? Our media streams run point-to-point by default, instead of through a relay, which results in the videoconferencing streams not transiting our infrastructure in the vast majority of technical scenarios. We do use a secure relay when necessary, as in the case of multiple Network Address Translation (NAT) devices situated between the endpoints. Start offering video today with a free 14 day no risk trial!